Illustrates the route of the Lexington and Ohio Railroad - the only railroad in operation in Kentucky until 1859. 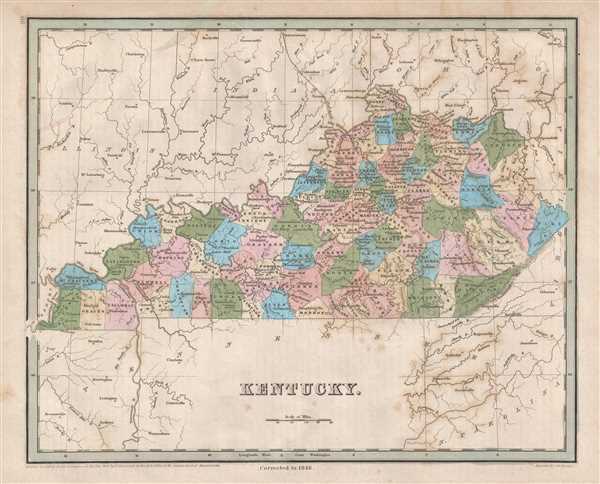 This is an 1846 Thomas G. Bradford map of Kentucky. The map depicts the region from Illinois and Missouri to North Carolina, Virginia, and Ohio and from Illinois, Indiana, and Ohio to Tennessee and North Carolina. Highly detailed, each county is labeled and shaded a different color for easy differentiation. Numerous cities and towns are labeled, including Frankfort, Lexington, and Louisville. The only railroad illustrated in the state connects these three cities. This route, operated by the Lexington and Ohio, was Kentucky's only railroad until the Louisville and Nashville began service in 1859. Very good. Even overall toning. Light foxing. Blank on verso.